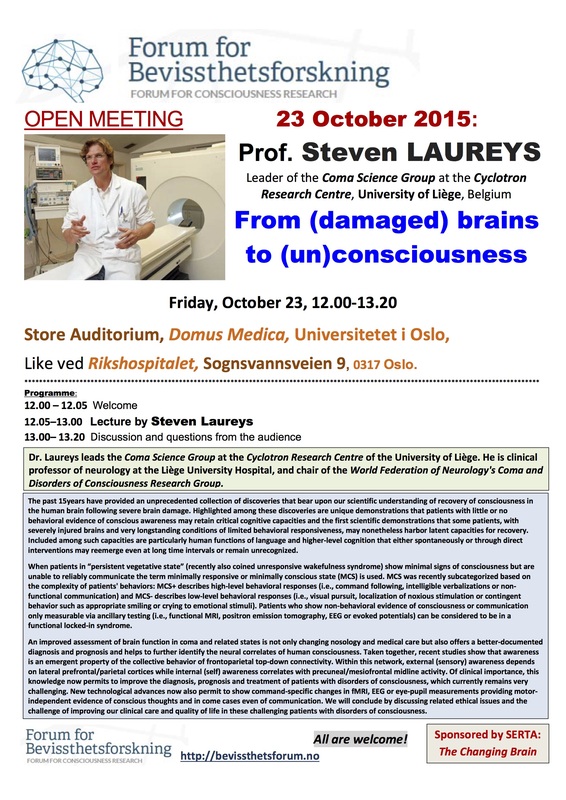 Dr. Laureys leads the Coma Science Group at the Cyclotron Research Centre of the University of Liège. 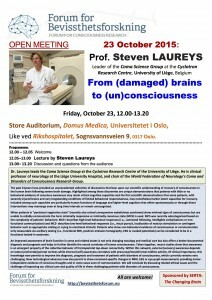 He is clinical professor of neurology at the Liège University Hospital, and chair of the World Federation of Neurology’s Coma and Disorders of Consciousness Research Group. When patients in “persistent vegetative state” (recently also coined unresponsive wakefulness syndrome) show minimal signs of consciousness but are unable to reliably communicate the term minimally responsive or minimally conscious state (MCS) is used. 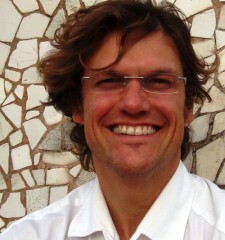 MCS was recently subcategorized based on the complexity of patients’ behaviors: MCS+ describes high-level behavioral responses (i.e., command following, intelligible verbalizations or non- functional communication) and MCS- describes low-level behavioral responses (i.e., visual pursuit, localization of noxious stimulation or contingent behavior such as appropriate smiling or crying to emotional stimuli). Patients who show non-behavioral evidence of consciousness or communication only measurable via ancillary testing (i.e., functional MRI, positron emission tomography, EEG or evoked potentials) can be considered to be in a functional locked-in syndrome. An improved assessment of brain function in coma and related states is not only changing nosology and medical care but also offers a better-documented diagnosis and prognosis and helps to further identify the neural correlates of human consciousness. Taken together, recent studies show that awareness is an emergent property of the collective behavior of frontoparietal top-down connectivity. Within this network, external (sensory) awareness depends on lateral prefrontal/parietal cortices while internal (self) awareness correlates with precuneal/mesiofrontal midline activity. Of clinical importance, this knowledge now permits to improve the diagnosis, prognosis and treatment of patients with disorders of consciousness, which currently remains very challenging. New technological advances now also permit to show command-specific changes in fMRI, EEG or eye-pupil measurements providing motor- independent evidence of conscious thoughts and in come cases even of communication. We will conclude by discussing related ethical issues and the challenge of improving our clinical care and quality of life in these challenging patients with disorders of consciousness.